Cook like Priya: Carrot Halwa | Gajjar ka Halwa | Carrot Halwa with Khoya to celebrate a 1000 fans!!! 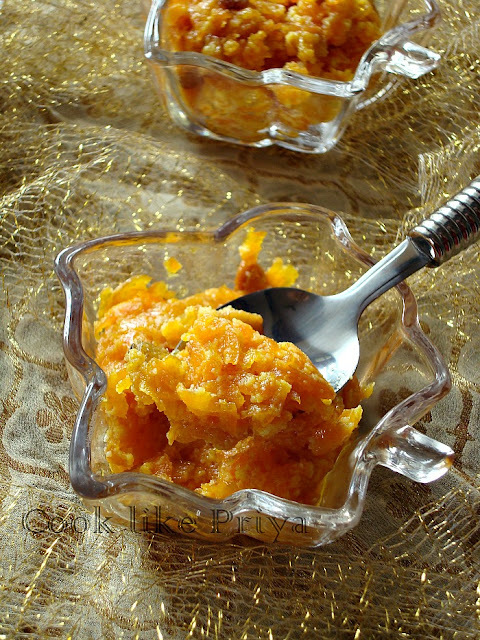 Carrot Halwa | Gajjar ka Halwa | Carrot Halwa with Khoya to celebrate a 1000 fans!!! Carrot Halwa is my most favorite dessert, I love to have it warm along with a scoop of Vanilla Ice cream that's my kind of dessert ;-) have you tried this combination? In most South Indian weddings this combination is served as a dessert during the wedding feast. The orange color and the topping of fried nuts and raisins does give a magical color to this yumilicious dessert. Although we call it carrot 'Halwa' the texture is soft and does not hold a shape like most Indian halwas, the soft juicy taste of carrots and melt in mouth taste of khoya makes this a dessert to die for, Oh not literally :P. Ok ask me why such a special dessert out of the blue? well if you are someone who follows me in facebook you would have known that my little FB page crossed 1000 likes and I felt it was time for a little celebration and hence posting this delicious and most loved dessert here. Now add the boiled milk to the grated carrots. Bring it to a boil and then simmer to medium-low flame and let it cook until all the milk evaporates. Once all the milk evaporates fully and the carrots are cooked completely add sugar and mix well. Within 2-3 minutes the sugar melts and combines well. Now add shredded khoya to this mixture and give it a good mix. Congrats Doll... Keep rocking... the halwa looks so so great..
Beautiful carrot halwa pics and love the new Summer look. Halwa looks delicious! Congrats for crossing 1000likes! Many congratulations PRiya ! The halwa and the new Logo both look amazing :) .. Its so you ! Congrats dear on 1000 likes, perfect and lovely way to celebrate the occasion. loving this wonderful sweet....did you make any changes on the blog title page or whole page..just a doubt? Congrats on 100 likes dear.. Wish you many more success.. Love your new look of the blog.. 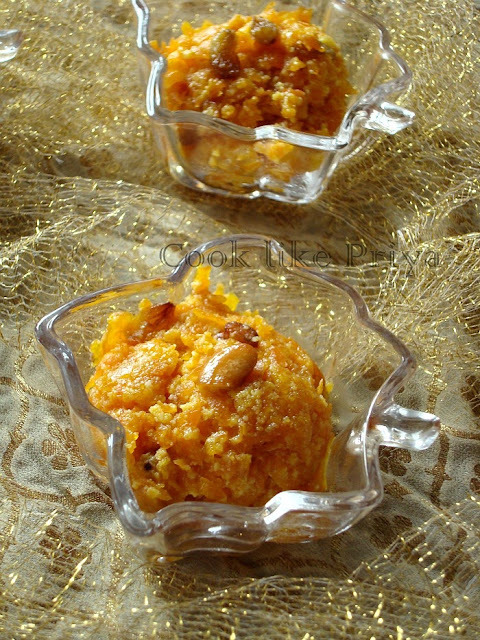 It's neat and elegant..
wow..love the new look of your blog, so beautiful da..
Congrats dear on crossing 1000+ likes...delicious halwa to celebrate the occasion...our family fav Halwa..looks yumm!! looks yum! my fav dessert! Congrats! 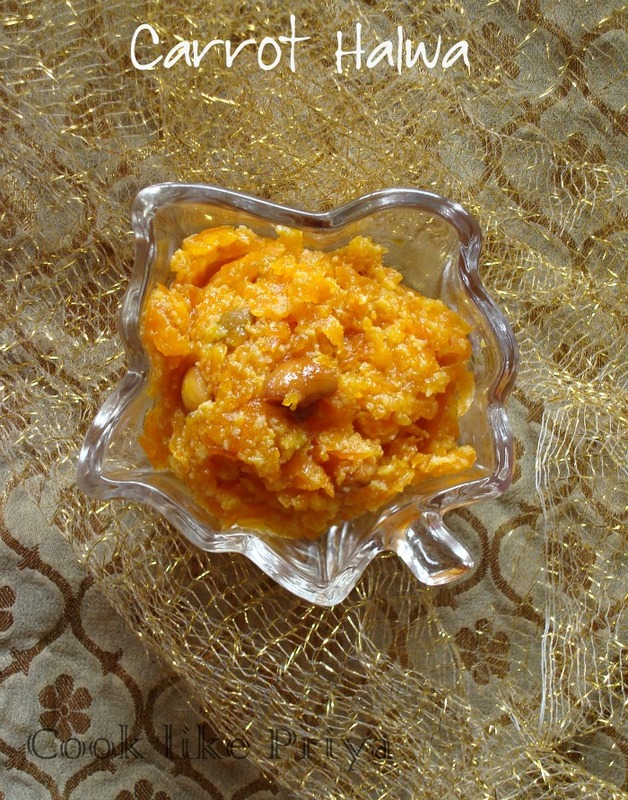 Carrot halwa looks delicious. Congrats on your milestone. Loved the look of the carrot halwa. I too am inspired to try preparing one using your method. Congrats for the 1000 likes :-) Halwa looks delicious. love the new format!!! my favorite color... :) :) congrats on the 1000 fans and the carrot halwa looks my types - nice and mashed!!! Congrats dear, wish u many more to come :) And that's a lovely new look.. Looks cute.. And a perfect way to celebrate with carrot halwa.. One of my favs ! congrats Priya, a well deserved accolade! and the halwa looks scrumptious! Congrats Sis, thats a huge milestone..wat an excellent way to celebrate this big achievement. Droolworthy halwa. scrumptious!!!!!!!!!! first time on ur blog.....Glad to know you..